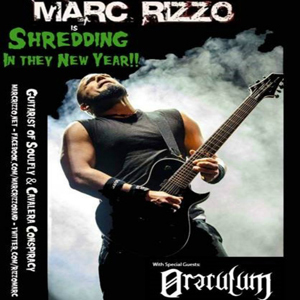 New Jersey native Marc Rizzo embarked on his first U.S. solo tour in 2007. He released two solo albums with Shrapnel Records in 2006 and 2007, entitled Colossal Myopia and The Ultimate Devotion, respectively. In 2010, Marc issued his latest album on his own Phlamencore Records, entitled Legionnaire. Rizzo has been endorsed by the likes of Peavey, Yamaha and B.C. Rich, and currently has a Washburn seven-string signature guitar available for public purchase.